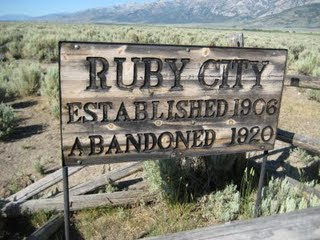 Two weeks ago we drove out to see Mary and Sam out in beautiful Ruby Valley, NV. Mary had the perfect picture on her blog to describe the valley where she lives. Home sweet home. I don’t know why it didn’t dawn on me that if it was supposed to snow here in Provo we would also be getting some cold weather in Nevada. Duh, I know. We had plans to ride horses and tractors, to see the cows and play with their puppy Alice. But when the snow hit the first night it killed all my plans. Actually, I wasn’t totally opposed to the snow; it was the temperature of 2º that I had issues with. Yes, it got down to two degrees in the night and only a little better during the day. Well, we still had a great visit, we just spent more time inside then planned. But it worked because Sam and Mary have a Wii. 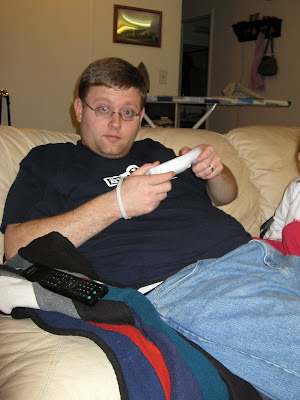 Here is Ryan not wanting to be interrupted from his game. Beth and Eric also loved playing with the Wii. Beth was entranced on many occasions. However, despite the fun of video games, the highlight of the trip for Eric was Alice. He absolutely adores her! He would have slept next to her if we had let him. While Beth gets thrilled out of her mind looking at pictures of dogs, or seeing them from a distance, she is so scared of them in real life. She did warm up to the point where she would touch Alice, but it was never a "comfortable" relationship. 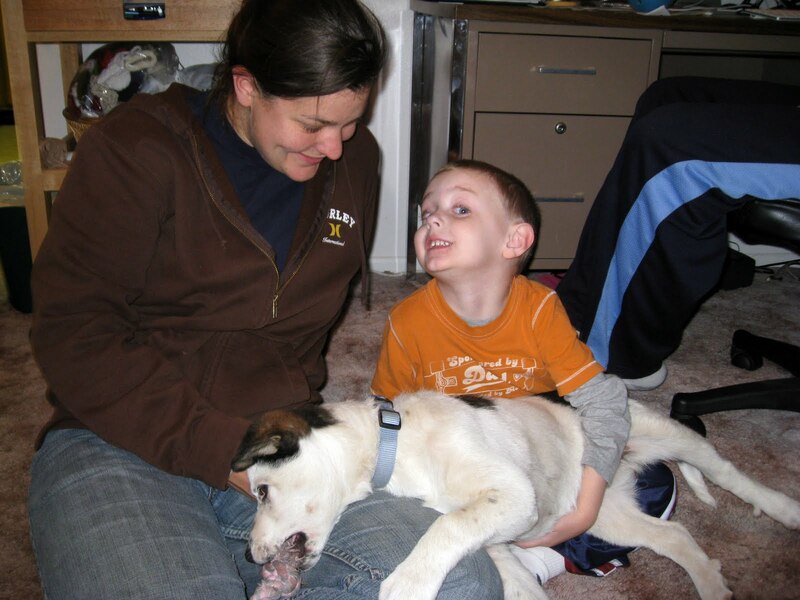 I'm grateful for Sam and Mary opening up their home to be overrun with kids and guests. We had a great time, thanks guys! Here's a quick recap of our Halloween this year. 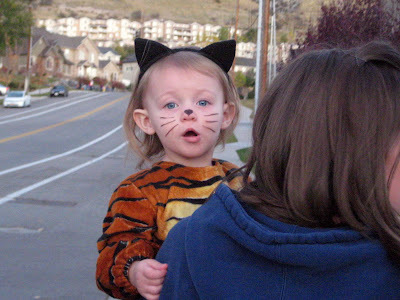 Beth was a very cute tiger. 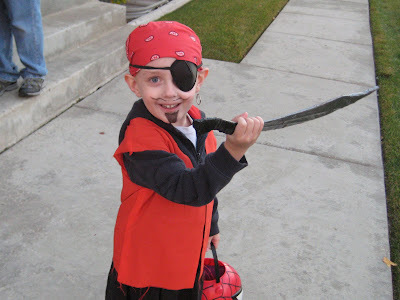 Eric was going to go as Thomas but at the last minute decided to be a pirate. Luckily we had all the stuff we needed to make the change. He enjoyed the increased freedom of movement that this costume offered over Thomas. 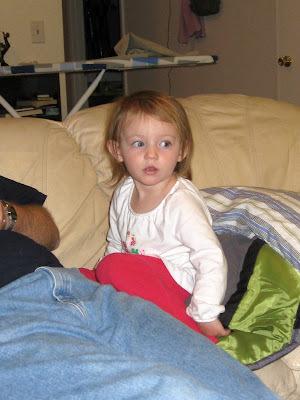 Beth was taken aback when some people opened the door. 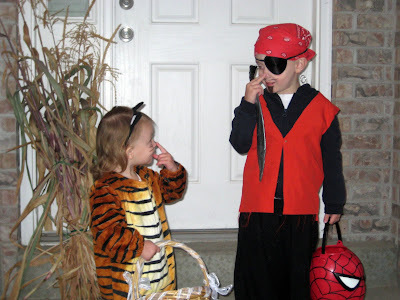 Eric would get so excited that he would say, "trick-or-treating" to everyone. It was very cute and when he finished up with, "thank you and happy Halloween," he gave everyone a smile. Eric was thrilled with the quantity of candy and Beth liked to chew on the chocolate bars while still in the wrapper. It was a great year. And a BIG thanks to Sam and Mary who came down from Nevada to spend Halloween with us. 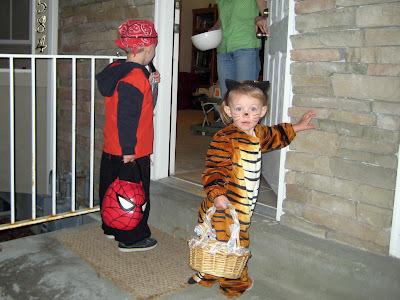 Sam stayed behind to hand out candy, and Mary came along and snapped these cute pictures. Thanks you guys! Ryan's Note: Now that we're through with Halloween, I thought I'd list my top five Halloween flicks. Not necessarily the scariest movies, just the ones I enjoy the most. #5: Ghostbusters. Classic, funny, quotable, old special effects that still look cool, and--of course--it's got Slimer! #4: Ernest Scared Stupid. Endearingly dumb, with tremendous sentimental value. And also highly quotable. "Hey booger-lips! How about a bumper sandwich!" #3: Anything from Alfred Hitchcock. Shadow of a Doubt, Rear Window, Rope, Vertigo. #2: Arsenic and Old Lace. Two words: Cary Grant. (Did you know his real name was Archibald Leach?) This movie has him, Priscilla Lane, Peter Lorre, the two aunts, poisoning, a towering homicidal maniac, and dead bodies stowed in every nook and cranny. Hilarious LOL moments. #1: Garfield's Halloween Adventure. I know this is a TV special and not a movie, but it's tops in my book. Funny and frightening for all ages. It captures the sheer candy-avarice and ghoulish delight of the holiday. If you remember this from the eighties, you know what I'm talking about. "Candy, candy, candy, candy . . . !" Now it's your turn. What are your top five?